Selling a home can be an emotional task. The job of a realtor is to help you sell your home with as little stress as possible. From hosting showings around your schedule to ensuring that potential buyers are properly vetted before entering your home, hiring a realtor can guarantee the sale of your home goes smoothly. 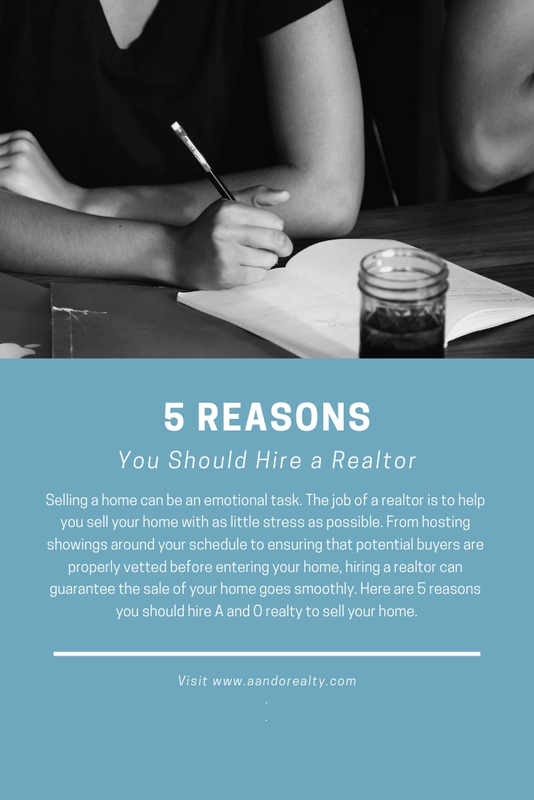 Here are 5 reasons you should hire A and O realty to sell your home. Selling a home is stressful, for many reasons. You have to deal with people walking through and commenting on your things. There’s paperwork, advertising and pricing. A realtor comes equipped with many resources from landscapers and painters who can give your house a facelift, to the knowledge of proper paperwork necessary to complete the sale. Their knowledge of the market gives them the tools necessary to negotiate a proper and faire price that meets your needs as the home owner. Realtor’s come with a list of potential buyers in their pocket. Since realtors both help to find and sell homes, they may often already know a potential buyer and if they don’t already have the perfect buyer, they have access to private realtor webpages and services that have the potential to get your home in front of the eyes of millions. Selling your home alone with no more than a sign in the yard and an ad on craigslist isn’t going to do it. Remember reason number one where a realtor could help save you from the sanity of having to negotiate, well this could help gain you more money as well or at the very least save you a bunch. A realtor can negotiate to have the new buyer pay the realtor fees. In addition, they can also help to get you the most money for your home either by negotiating the price upwards, or giving you simple suggestions that will make people want to pay more for your home. Don’t want your nosey neighbors to know you are selling the house? When you lease with a realtor, they have so many resources for getting your home visible online there’s no need for them to post a sign in your yard if you aren’t comfortable. By putting a for sale by owner sign in your front yard you are essentially sending out a notice to the world that you are going to have a lot of strangers entering and exiting. When you hire a realtor, all potential home buyers are preapproved before entering your home. A realtor helps protect your from inviting ill willed individuals into your home. From peace of mind to a better payout a realtor is always the way to go when it comes to selling your home. They have the speed, the time, and the ability to access millions of would be home buyers, don’t try and sell your home alone hire A and O realty today.